What is name of this font? 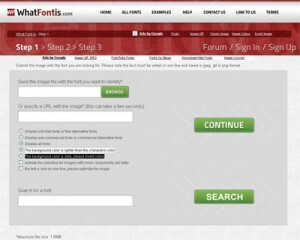 9 free tools to identify fonts. >> What is the name of this font? your boss asks you to reproduce a document or design that is now only available as a half torn piece of paper from 1998.
a client wants you to redesign their web site, but they don’t have their logo in digital font and instead hand you a business card with the words… “there’s the font for our logo”. you’ve seen a graphic on a web site that has inspired you and you want use the same font. In today’s digital word, designer or not, you often find yourself trying to identify a font. You just know you have seen it before but can’t remember the font name. So how do you identify a font? Well this post will give you some links that will help in your font identification problems. Find out the name of a font by answering questions about the characteristics shown within your typeface sample. 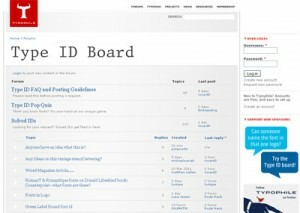 Whatfontis.com is a fairly new site with a nice easy design and layout. All you need to do is upload a photo/scan/image of the font you’re trying to identify. 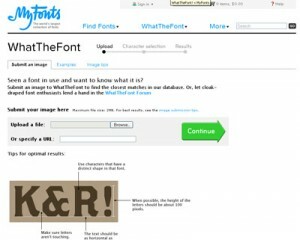 WhatTheFont.com is probably the most popular tool that people use to identify font names. Again it works by you uploading an image of the font. 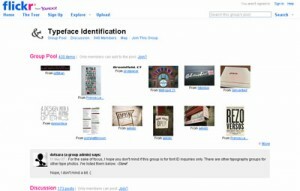 Flickr, best known as the photo sharing site has a group of users dedicated to identifying font names. Take a photo of your font and some font guru will be along to suggest its name. This font identification tool is slightly different. Through a series of questions relating to the characterics of the font you’re trying to identify it determines the most likely font name. At time of writing it uses a database of 3764 fonts. 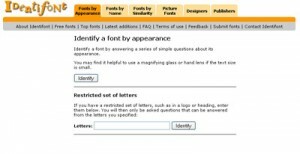 Identifont asks you a series of questions about the typeface appearance to identify the font name. 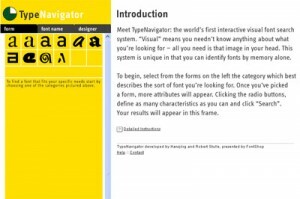 Type Navigator is an online tool from FontShop.com. It’s an interactive visual font search system. Type ID Board is a messageboard where you can upload an image of your font and the resident experts will help identify it for you. At time of writing this free Font-Spotter service from Bowfin Printworks allows you to email or fax a sample of the font for identification. I hope you find these resources useful in your font hunting tasks. Please let me know your thoughts on any of these services by leaving a comment.